Are you looking for a perfect accompaniment to a cup of coffee or tea? 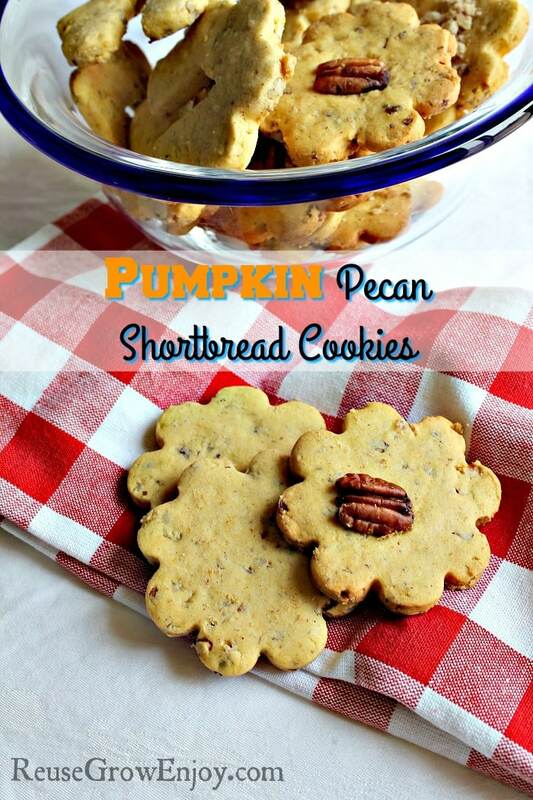 Make a batch of Pumpkin Pecan Shortbread Cookies and they will do the trick! This Pumpkin Pecan Shortbread Cookies recipe is simple to follow, and the resulting cookie is rich, tender, and crisp. It will certainly be a fall/winter favorites. The flavor of pumpkin is subtle. Too much pumpkin would alter the shortbread texture, but not enough and you won’t taste the pumpkin. This has just the right mix. The remaining pumpkin can be put into a freezer container and frozen for use later in pies or baked goods. That is unless you are making a few batches, then you will use it up. Since this recipe doesn’t use leavenings, the cookies will not spread when baked…great for making cookies that hang on the edge of a cup. There are many cup hanger cookies cutters on the market. You can also make your own by cutting a 1/2-inch wide strip out of the bottom center of the cookie, about 1-inch tall. Slant the top a little to make the cookie hang well. Both the dough and the cookies freeze well, so you might want to make a double batch while you’re in the kitchen! 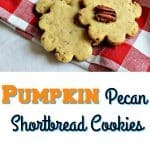 If you like this recipe for Pumpkin Pecan Shortbread Cookies, here are a few others to check out. In a large bowl, cream together the butter and powdered sugar until creamy. Add the egg yolk and pumpkin. Beat until the mixture lightens in color – about 1 minute. Sift together the flour, cornstarch, and spices. Mix into the batter to make very stiff dough. Roll out between sheets of parchment to 1/4-inch thickness. Cut with cookie or biscuit cutters. Gently press half of a pecan onto each cookie, if desired. Bake on parchment for 10-12 minutes, or until the bottom of the cookies is golden brown. Slide parchment onto cooling rack and allow the cookies to cool completely.